Roscoe Mitchell (saxophone), Hugh Ragin (piccolo trumpet), Junius Paul (bass) and Famadou Don Moye (drums) of the Art Ensemble of Chicago perform at London's Cafe OTO on Feb. 1, 2017. By 1970, the Art Ensemble of Chicago — a willfully eclectic, wildly experimental collective originally led by saxophonist Roscoe Mitchell — was already a sensation of sorts in Paris. It had a motto, "Great Black Music," which would soon be appended with a no-less-pointed second clause, "Ancient to the Future." So Bowie could have meant his comment to register in a few different keys: History was something to be channeled and challenged, as well as made. That conviction is worth remembering as the Art Ensemble of Chicago mobilizes this weekend for a celebration of its 50th anniversary. The group will perform a sold-out concert on Friday at Columbia University's Lenfest Center for the Arts, before headlining Saturday night at the October Revolution of Jazz & Contemporary Music, a new festival in Philadelphia. Then comes a three-night engagement, Oct. 15-17, at Café OTO in London, with other dates on the horizon. Mitchell and Moye are now the active elders in the Art Ensemble, which lost two other load-bearing pillars in Bowie (1999) and bassist Malachi Favors (2004). Founding member Joseph Jarman, a multi-reedist and flutist, no longer performs publicly, for health reasons. But he will participate in Friday's concert at Columbia — reading his oracular, metaphysical poetry, which has always been an integral part of the group's performance ritual. That concert has been framed as a tribute to Jarman. "I think it's wonderful, and extraordinary," he says by phone. The irreducible power of the Art Ensemble rested in its alignment of forces. "It was always a learning experience," reflects Mitchell, "because I was lucky enough to be with five individual thinkers." The group had a striking visual iconography as well as a sonic aesthetic. Bowie took the stage in a lab coat. Favors and Moye wore African vestments and tribal face paint. Jarman evoked the East in his attire, while Mitchell typically dressed like an American businessman. Each member of the band was a highly proficient instrumentalist with a distinct personal voice, and the pan-stylistic slant of the repertory — which could veer from boppish swing to earthy funk to absurdist or dead-serious abstraction — provided ample opportunity for displays of prowess. But the Art Ensemble also specialized in the expressive use of so-called "little instruments," like bicycle horns and bell trees, as if to undercut the currency of virtuosity. This multidimensional and collectivist approach was congruent with the ideals of the Association For the Advancement of Creative Musicians, out of which the Art Ensemble first emerged. 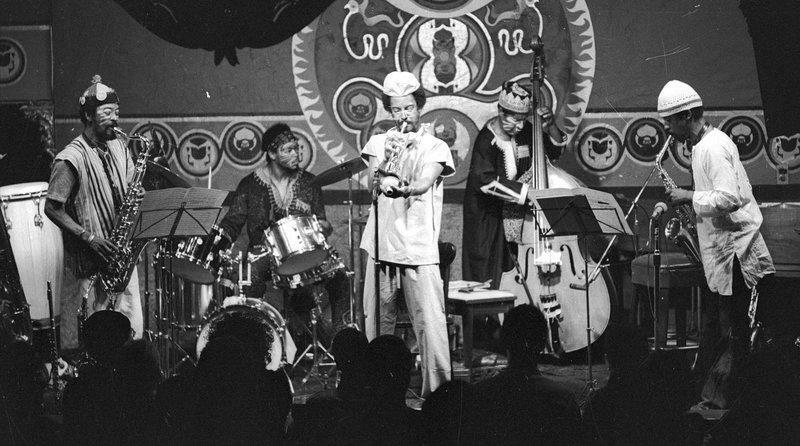 Jarman and Mitchell were part of the brain trust that established the AACM, in 1965; Jarman performed on the organization's first official concert. Because the Art Ensemble of Chicago was the first AACM band to receive international acclaim, the group was sometimes conflated, in those early years, with the AACM itself — a source of some grumbling at the time, as George Lewis documents in his essential book, A Power Stronger Than Itself: The AACM and American Experimental Music. "The group's unusual hybrid of energy, multi-instrumentalism, humor, silence, found sounds and homemade instruments — and most crucially, extended collective improvisation instead of heroic individual solos — proved revelatory to European audiences," Lewis writes. Other artists under an AACM umbrella, like saxophonists Henry Threadgill and Anthony Braxton, were creating and thinking along these lines too, and continue to do so. Members of the Art Ensemble of Chicago perform in San Francisco, Calif. in 1976. Then as now, the Art Ensemble was both a prominent AACM flagship and its own rogue vessel, disinclined to heed anyone else's navigation. Moye, who was once involved in AACM governance in Chicago, now lives in Marseilles, France, and downplays his involvement. On Friday, while the Art Ensemble performs at Columbia, the AACM's New York chapter will be presenting saxophonist Chico Freeman at the Community Church of New York — the first concert of its fall season. Obviously, these events could have been better coordinated. Mitchell maintains more contact with the AACM chapters in both Chicago and New York, and savors his place in the organization's pantheon. He has recently been a fountain of output — composing orchestral and chamber works; performing improvised sets with Lewis and AACM founder Muhal Richard Abrams; teaching at Mills College in Oakland; and making major statements like his stunning recent double album on ECM, Bells For the South Side. For all of its focus on cohesion, the Art Ensemble always encouraged outside forays by its members. "The intensity of the collective experience required that everyone have an independent vehicle, and be able to develop their own projects with the same dedication," says Moye. "That avoids conflicts. And it keeps everybody fresh." The reinvigorated Art Ensemble lineup bears some vestiges of that process: along with Mitchell and Moye, it includes trumpeter Hugh Ragin, cellist Tomeka Reid and two bassists, Jaribu Shahid and Junius Paul. These are all, as Mitchell points out, "part of the AACM family." They're also musicians with whom he has worked in other contexts, including his own bands. "It's inspiring that they feel they still have so much to learn and practice and write," says Reid of the AACM elders she has worked with, Mitchell prominent among them. "And this deep hunger to just get what they have out there. I feel like that's a lesson: Don't wait. Just do it now." The open question — and it may not be answered by the upcoming performances, or even answerable at all — is how the Art Ensemble can fulfill its original mandate in the face of so much change. The group has faced this predicament before: Non-Cognitive Aspects of the City - Live at Iridium, an album recorded in 2004 and released two years later (on Pi Recordings), was a prominent dispatch from the post-Favors era. So the only certainty, as the Art Ensemble embarks on its current journey, is that the musicians in the group will be striving toward a high standard of shared intuition, as improvisers and as members of a larger whole. History is on their side — as Jarman points out, in his own way. "I would not put anything against the idea of Art Ensemble of Chicago," he says. "That band was, and still is, a powerful organization among itself."